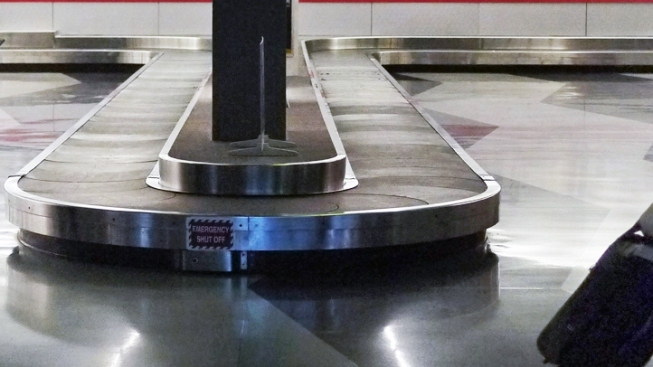 A San Francisco International Airport baggage handler accused of stealing dozens of items from airline passengers' checked bags appeared in a Redwood City courtroom on Wednesday, prosecutors said. George Reyes, 45, of San Francisco, came under scrutiny after United Airlines received more than 50 complaints from passengers that property was stolen from their luggage, according to the San Mateo County District Attorney's Office. San Francisco police investigators began looking into the case and discovered that Reyes was working at the time the thefts occurred, prosecutors said. In a sting operation on Tuesday, police placed GPS tracking devices on iPads and purses and put the decoy items in checked luggage, according to the district attorney's office. The items were taken from the luggage, and the GPS devices tracked the stolen goods to Reyes' car as he drove home from work, district attorney's officials said. Prosecutors said a subsequent search of Reyes' home turned up more stolen property. Reyes has been charged with having stolen property and two counts of embezzlement. He appeared in court Wednesday for his initial arraignment, and a judge denied his request for court-appointed counsel, according to the district attorney's office. The judge reduced his bail from $150,000 to $50,000, and Reyes has since posted bail and been released, prosecutors said. He will return to court on June 5 for further arraignment.